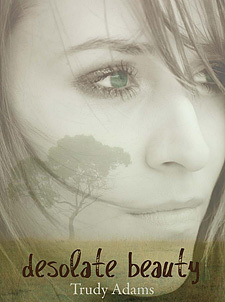 "Desolate Beauty', Trudy Adams novel for mid to late teens, explores the fact that the mistakes we make, or the mistakes of others that impact our lives, do not have to control our future. The main character Elizabeth Hunter is in her final year at school. From a dysfunctional home Lizzie has learned that emotional safety means keeping everyone at a distance " school friends, the teacher who tries to help her, her father who is just keeping the family together and her angry, rebellious sister. In each of these relationships she is torn " wanting security but not knowing how to find it; not being willing to trust others, just in case! The one safe place in her life is on her Aunt Judy's station "out back' of Hay. The story follows Lizzie's last year at school - the complexities of family, dating, friendship, the HSC " through to the final challenge of giving God a chance. The final third of the book ties off all the loose ends of their lives in a series of critical events. One event brings such desolation to Lizzie that she asks her father, "Why do people die? Why do bad people live until their one hundred and good people can die at nineteen? " It is through the adversities that Lizzie faces that she comes to understand that God can bring beauty, even salvation, out of the most desolate events and circumstances.